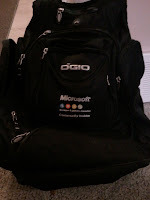 I won it at a Microsoft Event many years ago. It says Microsoft Insider. Its an OGIO branded backpack. I have used it to daily transport my goodies to and from, between work and home. Almost daily I will grab it, with a laptop inside, some power cables, various other emergency cables of all varieties, spare mouse with batteries, an MP3 player, and so on. It has become the haven for holding all those precious things that I may need and use for electronic uses. When I go on a trip, I can typically grab this bag, throw in some cameras and camera chargers, and maybe a book, and be ready for the weekend. Whatever happens, I've got a cable or tool in that bag for what I may need. As you can tell, I practice the motto 'Be Prepared'. 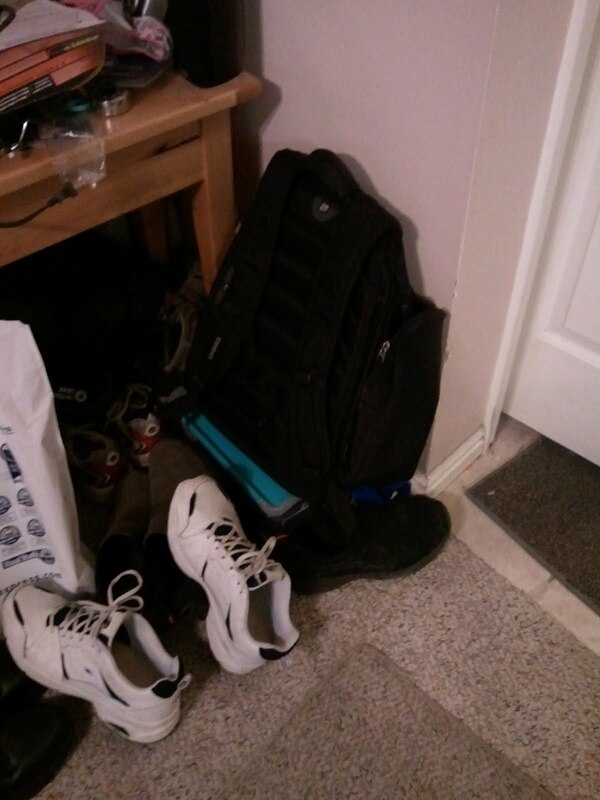 Ive done this as far back as this backpack has resided in my possession. Although the actual items have shifted during said time, the existence of these items, among any others that seem necessary has been constant. This bag has a place to rest at home. A thrown if you will, where only it lives. Its near the door, so I can grab it easily on the way out the door. At work, it always goes in a similar place of glory. Always where I can get to it, see it, be comforted by its existence and all it stands for. So, I changed jobs recently. I no longer have a laptop to bring home at night, nor to bring back to the office in the morning. I no longer have that single power cable for the laptop. My bag is a lot more light these days. But I continue to bring it back and forth. Now, the only purpose to do this is habit. The extra cables and power supplies and what nots are simply that, extra. Usually used in conjunction with a laptop. Either at the office, at home, or away. So, without a laptop in the bag, whats the point? It becomes a bag only. Not a super special device to hold all my special things. It ceases to have the purpose it once had. And I believe that it is silly for me to bring it back and forth under the old habit, since my circumstances have changed. Sit back now, look at what you do, day in, day out. Analyze these actions and detail to yourself which of those actions serve a purpose, accomplish a goal, and which are simply formed from habit. Those that are only habitual, really dig deep on them, and tell yourself if they still serve a purpose or not. I bet you will find some that you simply do because you have become accustomed to perform said action, and they may no longer be needed. If you do not have any, congratulations. Or maybe you didnt take as honest a look at your tasks. As for me, my bag is at home now. Still holding its collection of extra tools and what nots. But its not at the office. This entire week, i forced myself to not grab it and bring it. Forced myself out of my comfort zone to see if this tool, this crutch of a habit is really necessary. The jury is still out on that. I may need more time to fully realize the results of this small action. But I took the step to analyze myself, my actions and the usefulness of that tool. I hope you will do the same.